All parents are natural planners. As the parent of a child with a disability and a professional who assists communities and emergency planners with inclusive emergency plans, I know how much more critical emergency planning is for individuals with disabilities. My daughter has the Angelman syndrome, a rare condition that limits her independence. I’m concerned for her safety in an emergency—so my husband and I have a plan. Our daughter’s many medicines are in one place, we have a list of prescriptions, diagnoses, doctors’ contact information, and insurance; and we know how to contact our daughter’s adaptive equipment and medical supply vendors. This issue is important to the approximately 54 million Americans with disabilities and their families. At the Eunice Kennedy Shriver Center at UMass Medical School, my colleagues and I research and develop emergency planning solutions aimed at increasing equal access to emergency services, enhancing regulatory compliance, and promoting efficient response. Too often emergency plans don’t consider the needs of children and adults with disabilities, and they aren’t included in plan development. If a plan assumes that everyone can walk, talk, follow directions and move quickly, then many people with disabilities are left out. People with disabilities have experienced unclear emergency warnings, inaccessible shelters, lack of appropriate shelter services and separation from vital supports such as service animals and adaptive equipment. While the U.S. has come a long way toward “whole community” inclusive emergency planning and response, there is still a way to go. My biggest worry is that when disaster strikes, my husband and I won’t be with our daughter; she’ll have to rely on a caregiver or first responder to help her. Surveys and history indicate that while many caregivers stay with their clients, and there are heartwarming stories from prior disasters to back this up, some will not. I also worry that responders won’t understand my daughter and may leave her behind. So we have had tough discussions with caregivers about their self-preparedness and staying with our daughter until we arrive. I completed a form so that dispatchers would be able to alert responders to her needs, and I shared with our local EMS the names of hospitals likely to understand her disability. Many families with children with disabilities may not be well-prepared. 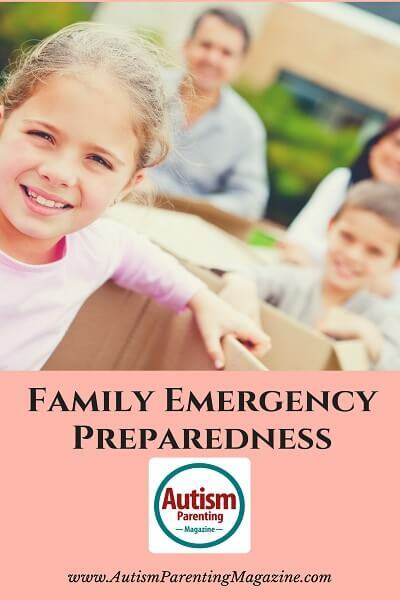 When an online survey I conducted asked parents of children with disabilities about specific emergency planning steps they had taken, most had taken fewer than half the suggested number. Have you done advance “What if” thinking and planning, a kind of personal risk assessment? Here’s an example: What if your child uses a motorized wheelchair and what if there is a power outage and you can’t charge the wheelchair? Do you have an extra battery? An additional source of power? A manual wheelchair? Do you have a quick “elevator story” about your child’s functional needs (without medical jargon) that you can tell to responders, neighbors, shelter personnel or other helpers? Do you have more detailed information about your child’s needs readily available? If your child is in school, do you ask about the school’s emergency plans? Do you discuss your child’s emergency needs at the yearly Individualized Education Plan (IEP) meeting? Are any particular plans for your child incorporated into the IEP? Do you know where your local emergency shelter is and whether it is accessible? Have you asked your child’s health care provider whether certain responder carries are safe? For example, some may develop breathing problems if they are carried over the shoulder in the traditional firefighter’s carry. Citizen involvement with local emergency planning is an important step toward community resilience, which will make it easier for a community to bounce back after a disaster. If people with disabilities, families, provider and advocacy agencies participate in local emergency planning efforts, it means that disability-related emergency issues can be raised by experts with lived experience and local emergency planners can respond accordingly. To me, that is a critical matter of health equity. Sue Wolf-Fordham, JD, is director of the Emergency Preparedness Initiative at UMass Medical School’s Eunice Kennedy Shriver Center. She has been working since 2005 to train first responders, public health planners and communities to include individuals with disabilities in emergency planning.